It was a mini-reunion for the actors of TVB’s Blue Veins <殭>. 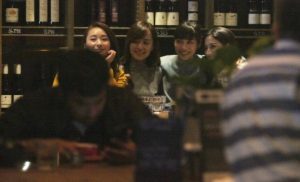 Last night in Tai Hang, paparazzi spotted Kevin Cheng (鄭嘉穎) eating out with his girlfriend Grace Chan (陳凱琳), along with their Blue Veins costars Anjaylia Chan (陳嘉寶), Jeannie Chan (陳瀅), and Winki Lai (賴慰玲). The five of them grew close after collaborating in the vampire drama two years ago. During dinner, Kevin sat at the end of the table like a boss, while the girls sat on either side of him. When Grace spotted the paparazzi out of the window, she waved and smiled. The girls took many selfies together throughout the night. Grace and the girls left the restaurant around an hour later, at approximately 11 p.m.
47-year-old Kevin and 25-year-old Grace started dating soon after collaborating in 2016’s Blue Veins, which was shot in 2015. 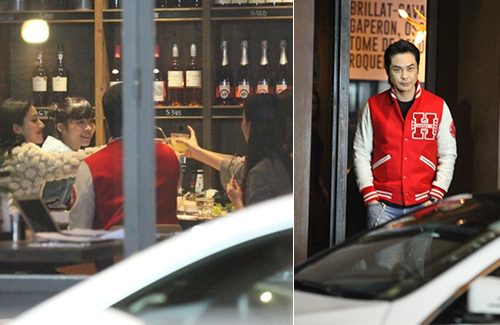 Their romance continues to be a hot topic to cover among gossip circles. @hannah Ha !!! Good one. He is giving Patrick Tze a run for the money as a geezer who loves his nieces and grand nieces.